Pegasystems (PEGA) is a $5 billion provider of CRM and business process management (BPM) software that enable transaction-intensive organizations to manage a broad array of customer interactions. The company's customers represent a wide range of industries, including banking and financial services, insurance, healthcare management, and telecommunications. This Q4 report represented a 5th consecutive quarter of strong results, as PEGA capitalizes on digital transformation initiatives in large enterprises and expands its cloud application offerings and capabilities. UnitedHealth (UNH), for instance, relies on PEGA to integrate artificial intelligence tools into their services and data analytics. In March 2010, Pegasystems acquired the enterprise software company Chordiant for around $161.5 million. The acquisition gave Pegasystems access to new markets such as online training, telecommunications and healthcare, with Pegasystems integrating Chordiant and its customer relationship management (CRM) technology into its existing operations. Pega Cloud was introduced using Amazon Web Services in 2012, and in October 2013, Pegasystems acquired the mobile application developer Antenna Software for $27.7 million. Located in New Jersey, Antenna also had bases in Kraków and Bangalore. As Pegasystems invests in marketing to compete with the big cloud players, earnings will make a slow recovery. 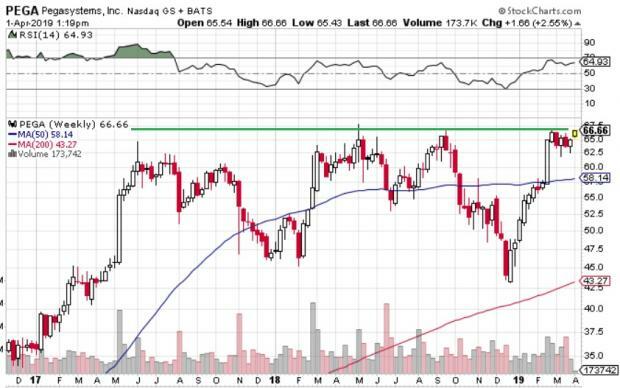 For me, the main metric to watch will be the sales growth — and a break-out to new all-time highs above $68 won't hurt either.